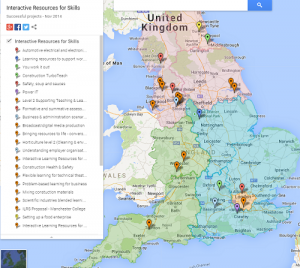 Welcome to the project site for Jisc’s Interactive Learning Resources for Skills project. This R&D project was based in Jisc Collections and it ran from Spring 2014 to Summer 2015. It had two aims: a) to create interactive content for Apprentices and b) to learn. At the end of 2014 we commissioned 22 projects to create open educational resources for a range of vocational areas. The commissioned organisations were on the Skills Funding Agency list of providers of vocational training for Apprentices in England. They are listed, with a brief description of their projects, and direct links to the content and to the relevant search-results page of Jorum (the national repository for OERs), on the right-hand side of every page of this site. All of the content we commissioned was completed in Spring 2015. Each commissioned organisation had a mentor from the JIsc project team. Mentors looked after five to seven organisations, facilitating networking and learning on all sides. We also drew on the expertise of Jisc’s subject specialists in areas related to content-creation. Some organisations have written blogs describing their own learning journeys over the course of the project. These can be found on their project page (right). This site was originally created to facilitate sharing of information between Jisc, the mentors and advisors and the commissioned organisations. It contains a wealth of resources generated during the content-creation phase of the project: as well as the links to the content itself, there are the checklists and templates created by and for the project team, and we will be creating a rich record of the insights gained by all involved in this exciting project. We set up a Jiscmail mailing list, ILRforSkills, for those directly involved in the project. If you’d like to join in the discussions around the project and the learning content we produced, get in touch via the form below. The map shows where the commissioned organisations are located (click on the image to go to the live version).